Walk across the dunes and you'll find a perfect spot for a day on the beach. Who says you can't swim on a rainy day? Just hop in one of the many indoor pools. Chill by the pool with the fam or walk down to the beach. 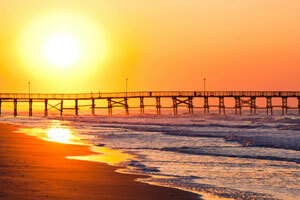 Set on the north end of Myrtle Beach, it's a great place for peaceful walks. The expansive property offers a secluded retreat with views in all directions. Don't let the weather keeps you from enjoying a swim, the resort has an indoor pool. Awarded a TripAdvisor Certificate of Excellence, Seaside Resort is conveniently located in North Myrtle Beach near the area’s best attractions but far enough to enjoy peace & quiet if you want to. Get your day off to the right start with the daily continental breakfast. Stop by your condo to get changed into swimsuits. Grab pool toys, water wings and goggles before heading out for a swim in the outdoor pool. Don’t forget the sunblock! Lounge poolside with the latest issue of People magazine or relax in the hot tub. The indoor pool, lazy river and hot tub will come in handy if the weather isn’t cooperating. Take advantage of Seaside Resort’s proximity to the beach. Work on your sun kissed look while the kids build the ultimate sand castle or look for seashells. During the summer, the Seaside Kid’s Club offers a variety of children’s activities including volleyball, corn hole and arts & crafts. One- to three-bedroom condos sleep six to ten guests and have enough space for all of the kids and their toys, blankets and games. A family field trip to the Publix Supermarket is definitely in order – your full kitchen won’t stock itself. Recruit the kids to help bake your famous double chocolate brownies (not that they’ll need convincing). You’ll appreciate the in-suite washer/dryer when the flour and eggs decide to go rogue. Cable TVs with DVD players are perfect for catching a sitcom rerun or for family movie night. Bring favorite movies from home or browse the selection of free DVD rentals available at the resort. Pop some popcorn and call everyone into the living room. First kid on the couch gets to choose the movie. Once the kids are in bed, enjoy a relaxing soak in the jetted tub. Golfers, rejoice! There are two golf clubs just a short drive from Seaside Resort: Azalea Sands Golf Club and Beachwood Golf Club. Flip a coin to choose where to go, or try them both and pick your favorite. When it comes to shopping, there are two options that are less than a half-hour away, and both feature a variety of shopping and dining. Barefoot Landing is only ten minutes from the resort. Del Sol features apparel, jewelry and nail polish that change colors when exposed to sunlight. Treat the kids with a visit to Candy Mike’s (open seasonally). Head to Sports Zone for t-shirts, jerseys and other sports apparel and memorabilia. Hungry? House of Blues, Joe’s Crab Shack and Stillhouse BBQ are just a few of your options. Broadway at the Beach is twenty-five minutes away from the resort. Need new shades? You’re in luck! There are three Sunglass Hut locations at Broadway at the Beach. Little ones will love Toys & Co. and Build-a-Bear. Restaurants include Hard Rock Cafe, Señor Frogs and Extreme Pizza. Go for a ride on the SkyWheel and check out the best views of Myrtle Beach. Let the kids explore the interactive exhibits at the Children’s Museum of South Carolina. They can be a weather person or newscaster at the Weather Center & Continuous News Desk, a bank teller at The Big Bang or a paleontologist at the South Carolina Fossil House. Guests must be 23 years old or older to check in without a parent or legal guardian. Indoor swimming pool and lazy river are heated year-round. Outdoor pools are heated from end of February until season begins, and mid-fall until November. The outdoor pools are not heated November through February.